Former Ducks football players can be found across the NFL. Oregon even had the distinction of having more former players starting in last year’s Super Bowl than any other college team with three. Over the last 20 years, 71 Oregon players have been selected in the NFL Draft, including nine first-round picks. In the 2015 draft, Marcus Mariota became the fifth Duck since 1999 to be drafted in the top five. Previous top three selections include Akili Smith, who was selected third overall by the Bengals in 1999. After being drafted, Smith struggled to find his footing in the NFL and was released by the Bengals after only four years. In the 17 games he started over that time, he threw only five touchdowns compared with 13 interceptions. Three years later, in 2001, Joey Harrington was selected third overall by the Detroit Lions and showed some promise during his rookie season with the struggling 3-13 Lions. Things did not improve for the Lions after Harrington’s rookie season and he struggled through three more years in Detroit before bouncing to Miami, and then Atlanta, before leaving the league in 2007. While not a complete bust, Harrington never quite lived up to the expectations associated with being the number three overall pick. More recently, Dion Jordan was selected third overall by the Miami Dolphins in the 2013 NFL Draft. After struggling his rookie season with shoulder injuries, Jordan is now weathering some off-field issues. Hopefully he can get his life in order and make a turnaround, as he is only 25. Drawing any conclusions regarding Mariota’s destiny in the NFL based on Smith, Harrington, or Jordan is foolhardy. Each of these beloved Ducks are very different players. For starters, Jordan plays defense. And while Harrington and Smith played quarterback, neither of them is a good comparison to Mariota, as everything from their skill sets, to the coaches they played for, and the systems they played in at Oregon and the NFL, are very different. 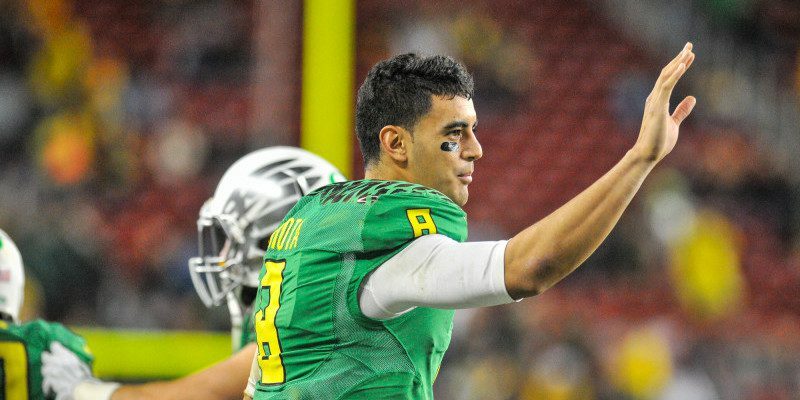 Reviewing those top-three Ducks who struggled in the NFL is more about helping us, as fans, to manage our expectations for Mariota and highlight how difficult it is to transition college success to the NFL. 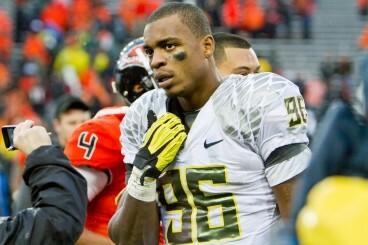 Dion Jordan starred at Oregon but has struggled with injuries, suspensions, and production on the field. To Ducks’ fans delight, though, many former Oregon players have made the successful transition to the NFL in recent years. Former Ducks Kyle Long, Jairus Byrd, Max Unger, and Haloti Ngata have all made Pro Bowls in recent years. Additionally, many other former Ducks have carved out nice careers in the NFL, including Jonathan Stewart, Patrick Chung and Kellen Clemens. Early reviews of Mariota from the Titans’ first few practices have been positive. While this bodes well for Mariota, it would be foolish to look too hard into a few offseason workouts for any rookie quarterback and think you can accurately project his future NFL success. Additionally, coaches’ and players’ reviews of a rookie teammate are generally fairly canned responses. Right now, there is no way to know for certain whether Mariota can translate his incredible success at Oregon to the NFL and become an elite NFL quarterback. As Oregon fans, we can only hope Mariota can reverse the trend of Ducks being taken as top three picks and falling flat in the NFL. Mariota appears to have all the tools. It will be exciting over the next few years to see him put them on display and develop a successful NFL career.